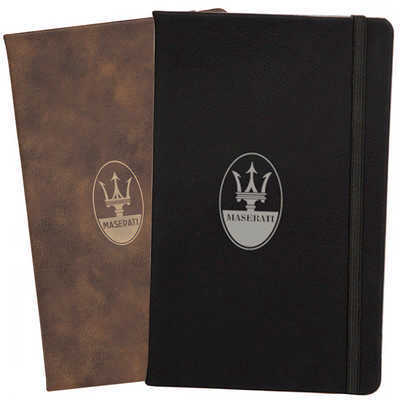 Classic journal with built in elastic closure and 80 sheets of lined paper. Sueded Leatherette is made using PU material and is decorated using a special laser that removes the surface colour from the material. A secondary metallic colour has been hidden under the surface layer which is exposed during decoration. Black material reveals a metallic silver colour and the Brown material reveals a metallic gold colour. Individually packed in AGRADE muslin drawstring bag and black shiny gift box. ?Material: Sueded Leatherette (PU) Colours: Black or Brown, Dimension: 134mm w x 212mm h. Price includes : 3 Day Service* Laser Engraving - One Location. Setup is included.